In my ongoing hunt to obtain every comic book Bill Mantlo ever wrote, I’ve made it through most of the easy acquisitions and started working down the rare and obscure issues. I am unsure if and when I might own a handful of them, such as Uncanny X-Men #96 and Marvel Preview Presents #7, which is currently averaging several hundred dollars since it contains the very first appearance of Rocket Raccoon. Fortunately, I was able to fill in many of the gaps in my wish list for this campaign at C2E2, the Chicago comic book convention held in late April. One of the more pricey items I picked up is something I can now cross off that “hard to find” list, The Invincible Iron Man #86. Now, it wasn’t anywhere near the original cover price of 25¢, but I found it in immaculate condition. More importantly, it is a wonderful story from the greatest age of Marvel Comics, but since it did cost me so much, I drank my cup of coffee this morning BEFORE unpacking it from its protective sleeve. I happily bring you, “The Gentleman’s Name is BLIZZARD!”. As the Golden Avenger soars above the busy streets of New York City with some very distinctive passersby underneath, Iron Man flies to the rooftop of a hospital where Happy Hogan is being treated. He activates some sort of charge from his gauntlets and chest plate which causes his armor to retract, and moments later Tony Stark is making his way down the hospital hallway to see his friend, chauffeur and bodyguard. He finds Happy with his wife and Stark’s secretary, Pepper. Because of his recent deceptive behavior (in earlier issues), Pepper is cold to Tony’s arrival, yet Tony does his best to cheer his buddy up. In the meanwhile, two security guards are enjoying the Indian Summer while on duty at Stark International’s Long Island Complex (one reads a copy of “Newsday” with an ad on the back cover for “Marvel Con”, a not-so-subtle plug for the company’s upcoming convention). Suddenly, an unnatural blizzard crashes through the security office window and a figure garbed in dark blue tights with icicles dripping from his mask appears outside. He is BLIZZARD, a mysterious man with the power over sub-zero cold weather, and he loves referring to himself in the third person. His power protects him from the guards’ bullets and he makes short work of them with his cold powers as he strolls uncontested into Stark’s facility. As Tony leaves the hospital, he is confronted by Michael O’Brien, who is looking for answers related to the death of his brother back in issue #46 (see Comics ‘n Coffee from March 31, 2013 for more on Michael O’Brien’s story). Somehow, Michael has gotten wind of the break-in at Stark’s Complex and Tony rushes off to verify the story’s authenticity. A quick change later into his armor allows Tony to fly off at breakneck speed to respond to this new threat. From the street level, however, Pepper spies Iron Man’s departure and concludes that she owes it to Tony to warn him that some madman calling himself Blizzard is after Stark’s CLIMATRON, which can be used to alter weather patterns. Shellhead arrives at his complex and follows the trail of ice-covered corridors in pursuit of the intruder. He’s never felt such intense cold and it causes his transistors to work in overdrive just to remain in operation. Blizzard arrives at Stark’s Anti-Particle Safe and uses his incredible cold-producing power to crack the safe open, but finds Iron Man arriving at just the crucial moment before he can take possession of the Climatron. The two do battle and Blizzard quickly gains the upper hand – cutting through Iron Man’s armor with ice darts (“as sharp as adamantium knives”) – all while Pepper makes her way down the ice-covered hallways in search of her boss, Mr. Stark. Tony finds that his every attempt to gain an advantage against his foe meets with failure. The cold is seeping through his armor so that he can barely move and barely think. His breath becomes frozen and he can even feel his own heart freezing! As Blizzard seals the Armored Avenger in a tomb of ice, at that moment Pepper Hogan arrives on the scene, screaming “You monster! You’ve killed him! You’ve killed Iron Man!!”. Bill Mantlo is known for several seminal runs on Marvel titles, but one of his first was Iron Man. He scripted 23 issues and one annual before leaving the book to write such titles as Spectacular Spider-Man, The Incredible Hulk, Rom Spaceknight and Micronauts. This issue features all of his characteristic marks, namely interesting supporting characters and moments which make the reader think, all within the classic Marvel style. As you would expect, the art by “Gorgeous” George Tuska is absolutely phenomenal. The faces on his characters are beautiful and expressive, and the framing on each page demonstrates masterful storytelling. This is a two-part story, however, and it left on such a cliffhanger, so despite the challenge of finding such a rare gem, I must track down part two. It’s going to be a long search for which I will need a great deal of coffee to endure the journey. Happy reading, true believers, and Fare Thee Well! 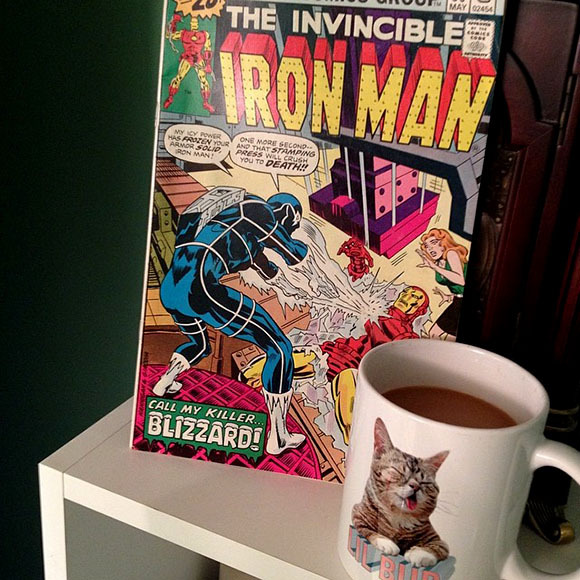 The Invincible Iron Man #86 is written by Bill Mantlo, penciled by George Tuska, inked by Vince Colletta, lettered by John Costanza, colored by George Roussos and edited by Marv Wolfman, with a cover by Ed Hannigan, Frank Giaccola and Danny Crespi (1976).